If you have a favorite Marvel hero, odds are that they have some kind of pet, be they mammal, reptile, insect, or “other,” that will follow them into battle any day of the week. To celebrate National Pet Day, here are seven of the most loyal animal companions in the Marvel Universe (and Spider-Verse). 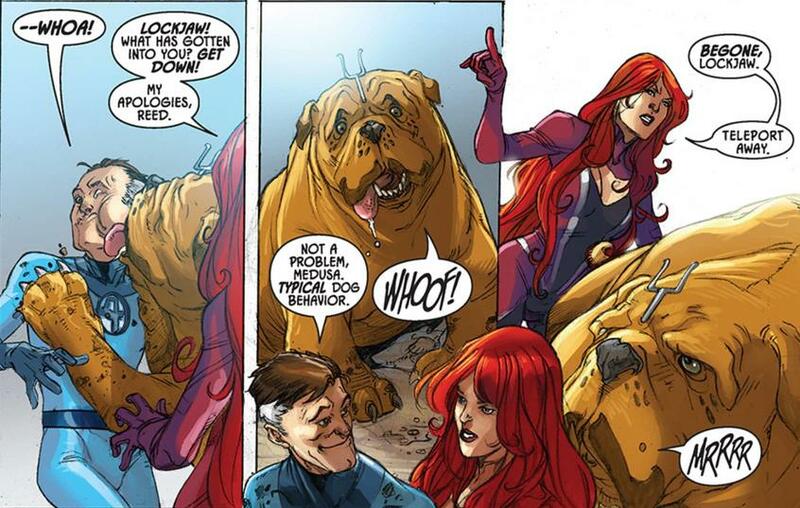 He’s more than just an Inhuman’s best friend, he’s Lockjaw! A slobbering, teleporting, and beloved member of the Inhuman royal family, one now-debunked theory was that he may have been a regular person once upon a time who was mutated by the Terrigen Mists. Nevertheless, Lockjaw has always been a fixture of Attilan. Able to transport himself and others across great distances (think Earth to the moon), Lockjaw, aside from resembling a massive bulldog, is known for the antenna that sits atop his head. Loyal to the very end, he’s also been known to take action when his masters and their allies are too short-sighted. For example, Lockjaw founded the Pet Avengers and then led them in stopping Thanos from acquiring the Infinity Stones. “Another dog?” you might be thinking. Well, here’s a little fun fact: Just like in our reality, the Marvel Universe is full of them! You don’t just have Lockjaw, but Cosmo, Sassafras, Dogpool and Bats, because every Master of the Mystic Arts needs someone to scratch behind the ears every once in a while. 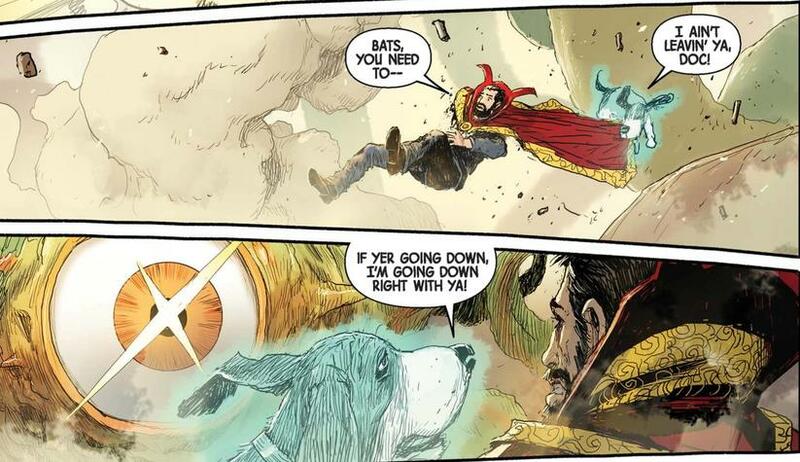 When Loki defeated Doctor Strange and became the new Sorcerer Supreme, Stephen became a vet and good friends with a talking Bassett hound named Bats. With no complaints whatsoever, Bats went on a spying mission for Strange to find out what Loki was up to and discovered that he was trying to invoke a devastating spell known as the Exile of Singhsoon. Bats also had no objections to being walked by Strange’s astral self, which definitely looks weird to other folks not used to seeing a leash hanging in mid-air. We’ve got a T. rex coming up soon, but not before our favorite alien dragon. During a fight with the insectoid Brood, Kitty Pryde was saved by a purple dragon who would later be dubbed Lockheed. He eventually returned to Earth with Kitty and the X-Men and became their fire-breathing pet of sorts. He shared quite a bond with Kitty and was once terribly wounded while protecting her from Doctor Doom. Don’t worry, he made a full recovery and even got to go on adventures of his own! Along with Kitty, he helped found the British team of heroes known as Excalibur. What the Flerken?! The next loyal pet on our list is Captain Marvel’s "cat," Chewie. While they may look like cats, Flerkens house entirely different dimensions inside their bodies. Even so, this never prevented Carol from loving Chewie like any other house pet. In a pinch, Chewie has been used as a weapon by Danvers against the likes of the sorcerer known as Sir Warren Traveler. Still, Chewie never complains, happy to do her master’s bidding so long as she can curl up in Carol’s lap at the end of a long day. Not everyone is so keen on having an arachnid for a pet, but for Peni Parker, that’s just regular life – particularly if that arachnid shares a psychic connection with its owner. Working in tandem with her psychic spider, Peni is able to pilot her late father’s mecha-inspired SP//dr suit. Because of that, Peni and her pet may have one of the closest (if not the closest) connections in the entire Marvel Multiverse. How many kids actually get to live their fantasy of having a real live dinosaur (especially a red-scaled T. rex) as a pet? The answer is just one: Luna Lafayette, aka Moon Girl. When a rip in the space-time continuum brought them together, Luna wasn’t a big fan of Devil Dinosaur, who did nothing but cause destruction wherever he stomped. Nevertheless, the fight against the Killer Folk brought them together and they’ve been inseparable ever since. 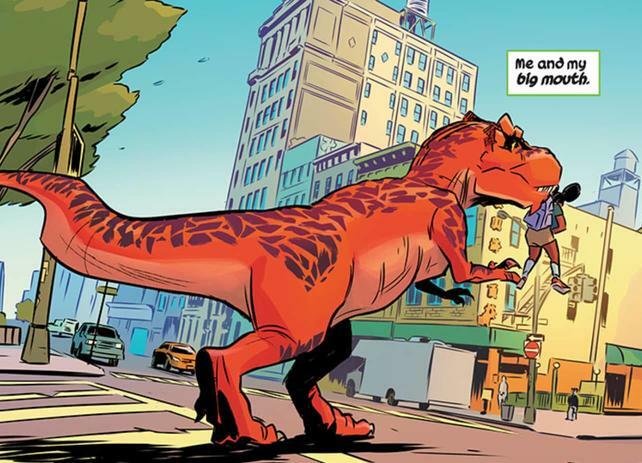 In essence, Devil Dinosaur is basically a big dog with razor sharp teeth and 65 million-year-old DNA. Galactus help you if you try to harm Luna on his watch. In fact, both he and Luna will meeting Thor for the first time in their very own WAR OF THE REALMS tie-in. 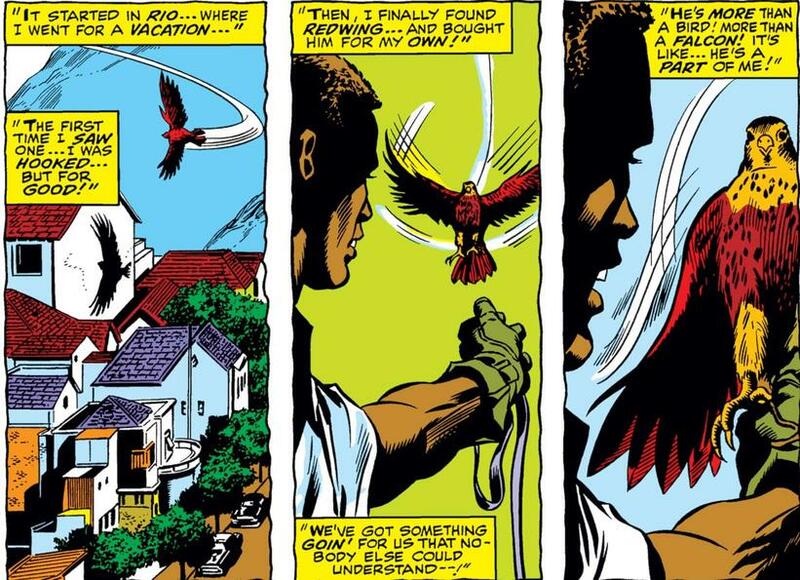 Redwing, a falcon, made his world debut in the pages of CAPTAIN AMERICA (1968) #117 alongside his owner, Sam Wilson aka Falcon, and their lives have been intertwined since the very beginning. After making friends with the Red Skull without realizing it, Sam explained his lifelong affinity for birds and how he met Redwing. Wilson summed up their relationship perfectly when he says, “We’ve got something goin’ for us that nobody else could understand.” Indeed, Redwing will do anything Sam asks of him and come home when it's all over.